Here are some more of my Nfu Oh 'on sale' flakies haul. I certainly can't rave about these polishes on their own. At least they are wearable (unlike the yellows), but the colours are non descript and so incredibly sheer. 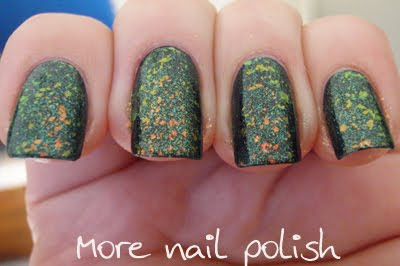 #55 is a sheer green polish with a green shimmer and orange flakies. This swatch was three coats. Reminds me of bottle green. Up close angled shot to see the orange flakies. 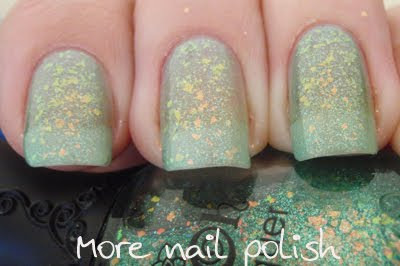 #57 is similar to the above polish except it is a lighter green tint. Same green shimmer and orange flakies. Three coats. Up close it's very similar to #55. Again, over black the magic happens. This shows #55, then #57, #55 and #57. 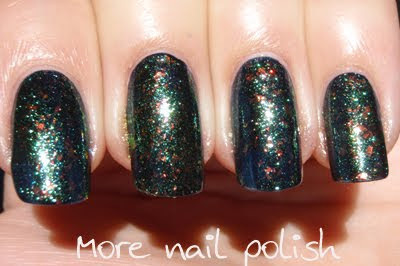 As you can see, over black both these polishes are identical. Same in the sun. Notice how these flaky polishes are really much prettier indoors than in the sun. You loose all the flaky bits in the sun. Finally a zoom in, #57 on the left, #55 on the right. 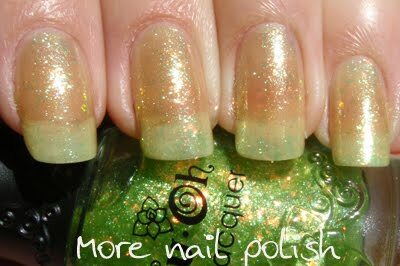 You can clearly see the green shimmer and the orange flakies, but notice here you can really see a duo chrome effect in the flakies and they go from green to yellow to orange. Very cool. Anyway, gotta run. Survivor Heroes v Villains final episode just started and I'm tragically addicted to the show. Great post! Love the comparisons.